Happy 39th birthday, Star Wars! To celebrate, we’ve got a new episode of Unboxing Star Wars! 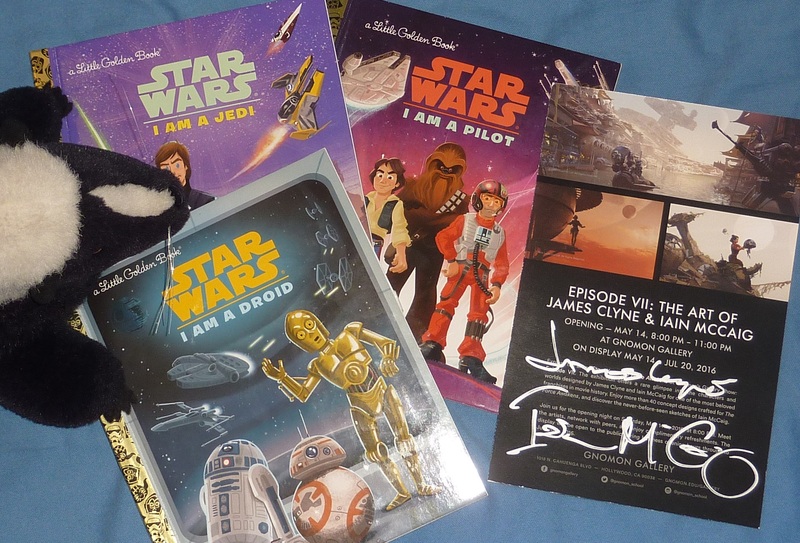 Yowie the skunk, Baby Jawa, and I review some of the latest crop of Star Wars Little Golden Books: I Am a Droid, I Am a Pilot, and I Am a Jedi, as well as I give my recap on the James Clyne and Iain McCaig presentation and The Force Awakens concept art exhibition at Gnomon in Hollywood. For more info on the presentations by Art Director James Clyne and Concept Artist Iain McCaig, check out my article on starwars.com: Designing The Force Awakens. Also, check out photos from the concept art exhibition and the artists’ presentation. Plus random fun with Ponda Baba, and then some Baby Jawa fun time! → I Am a Droid – Thumbs up! Written by Christopher Nicholas and illustrated by Chris Kennett, this Little Golden Book focuses on different aspects and roles of droids in Star Wars. My favorite of the bunch, though possibly could have done without a page showing a droid being tortured. → I Am a Jedi – Just OK. This Little Golden Book by Christopher Nicholas and illustrated by Ron Cohee talks about the basics of what a Jedi is and what a Jedi can do, and a little about the Force and the Sith. Nothing from The Force Awakens, but it does reveal the identity of Darth Vader, just in case you want to save that revelation for later in your child’s life. → I Am a Pilot – Just OK. By Christopher Nicholas and illustrated by Alan Batson, this Little Golden Book showcases a bunch of different pilot characteristics in Star Wars and some of the more famous pilots. Sadly, none of the pilots in the book are women. → Episode VII: The Art of James Clyne & Iain McCaig at Gnomon Gallery, Hollywood – Go see it if you’re in the area! There’s almost fifty pieces on display, pretty evenly split between Clyne and McCaig. I *think* all of the displayed artwork can be found in The Art of Star Wars: The Force Awakens, but here’s a chance to see it in a larger format. The exhibition runs until July 20, 2016. Note: No Aqualish were harmed in the filming of this program.